Peru hosts 70% of the tropical glaciers in the world. However, these glaciers have been melting at an unprecedented rate in recent years, losing 40% of its glacier area in the last 40 years. In April 2010, an ice avalanche from Hualcan impacted a glacier lake (Laguna 513) in the Cordillera Blanca, Peru. It triggered a flood wave that caused damage in downstream population centers, including the city of Carhuaz. Here we present the process of implementing Early Warning System (EWS), which includes not only a scientific approach, but also a social one. Identifying vulnerability and capacity: a diagnosis was made to collect the social perception of threats, using the Climate Vulnerability and Capacity Analysis tool. In these workshops the population identified four climate threats of major importance, the most important being the alluvium. Scientific information: technical and scientific studies were held to corroborate the social perception, including: biophysical and socioeconomic characterization of sub basin Chucchun as water balance, characterization of the flora, hazard characterization glacial, climatic characterization, identification of climate change scenarios. Building resilience: All information was integrated in a risk analysis, in which the threat was identified as the impacts of climate change and vulnerability, biophysical and socio-economic conditions of the population. The adaptation measures aim to reduce vulnerability. An Early Warning System designed, installed and operating, based on communitie’s perceptions and concerns, with the scientific information support. • The population and local authorities are aware of risks, and are ready to have an effective response to a new event. 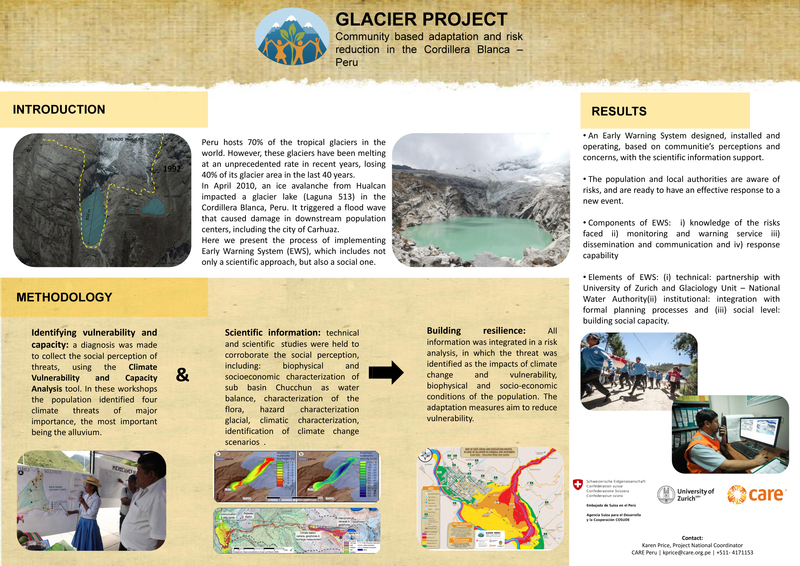 • Elements of EWS: (i) technical: partnership with University of Zurich and Glaciology Unit – National Water Authority(ii) institutional: integration with formal planning processes and (iii) social level: building social capacity. Poster produced by Karen Price, Project National Coordinator, CARE Peru. This poster is one of the posters featured at the 9th International Conference on Community-Based Adaptation (CBA9) took place in Nairobi, Kenya, from April 24-30 2015. The CBA series of conferences focus on the latest developments in community-based adaptation to climate change. The theme of this year's event was "Measuring and enhancing effective adaptation", and all the posters presented at the conference were summaries of projects related to the conference theme. For more information about CBA9, visit: www.cba9.org. If you want to learn more about community based adaptation, please visit the GICBA platform on weADAPT. Click here to read more about CBA9 on weADAPT. Click here to read more about CBA9 on IIED's page. Click here to see all the posters presented at their Pinterest page. Click here to see all the posters presented at their Flickr page. How can young people contribute to building village as eco friendly climate village? Join us for CBA13 - registration now open! Describes an approach to climate change adaptation and outlines how ongoing community measurements of threates to water resources is used to enhance adaptation effectiveness in 3 Sahelian countries. This report and webinar is a resource for practitioners from field staff to policy makers to use when engaging the public around flooding and wider climate impacts.